Watercolorist Olivia Rutherford fashioned her image as an avant-garde artist to appeal to the region's wealthy art-collectors. When she lands a lucrative contract painting illustrations of Yosemite National Park for a travel magazine including its nightly one-of-a-kind Firefall event, she hopes the money will lift Olivia and her sisters out of poverty. After false accusations cost him everything, former minister Clark Johnson has found purpose as a backcountry guide in this natural cathedral of granite and trees. Now he's faced with the choice of becoming a National Parks Ranger, but is it his true calling? 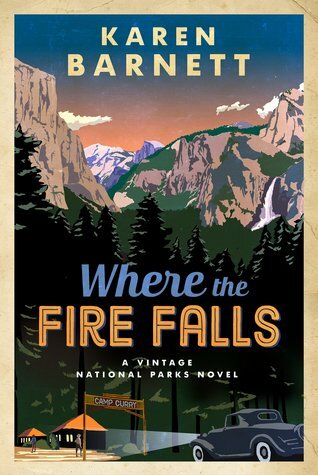 As Clark helps open Olivia's eyes to the wonders of Yosemite, she discovers the people are as vital to the park's story as its vistas-- a revelation that may bring her charade to an end. Clark Johnson and Olivia Rutherford are captivating, multidimensional characters. I enjoyed watching their arcs develop and intersect throughout the novel. Olivia with her watercolor arts and Clark with his crooning cowboy ways brought their own unique flavor to this 1930s novel. Socialites Marcus and Sophie won't be easily forgotten. Chief Ranger John and vaudeville singer Melba, as well as Charlie, and Louise all supported the plot well. I loved the gentle pace of the romance with the characters developing a steady friendship before growing closer emotionally. The hero's nature lent a beautiful, protective quality, and contrasted well with the magnificent wildness of Yellowstone. One puzzling aspect was that Clark, a devout former minister, didn't have any qualms about romancing a woman who didn't hold any religious beliefs, at least until much later in the novel, which seemed odd given his complete devotion. Otherwise, their story was organic and interesting to watch unfold. The novel was well-measured. Leisurely enough to enjoy the history and described scenery of the National Park, but mysterious and suspenseful where it needed to be, especially toward the end. Clark's faith-thread was interesting and well-developed, though there were some truthlets I wasn't entirely on-board with. Just minor things, though. Olivia's faith-journey, however, was murky for me. She came to be presented as a believer in the end of the novel, but her spiritual growth consisted of questioning God and then praying when she was desperate. The scenery witnessed to her of God's handiwork, but there was little if anything mentioned of Christ and His saving work on the cross, His death for our sins, and resurrection. Some may call that concept too "preachy" to include in a novel, but there was enough religion in this novel to be considered preachy, if someone were offended by such things. If a novel is going to be overtly religious, and depict a character coming to Christ, why not include the truth-message that can change a life, more than just an intellectual acknowledgement of a loving deity? The stakes and motivation were well balanced, the novel full of rich imagery and delightful era lingo. The first novel in the series is my favorite of the two, but I still look forward to reading more books by this author.